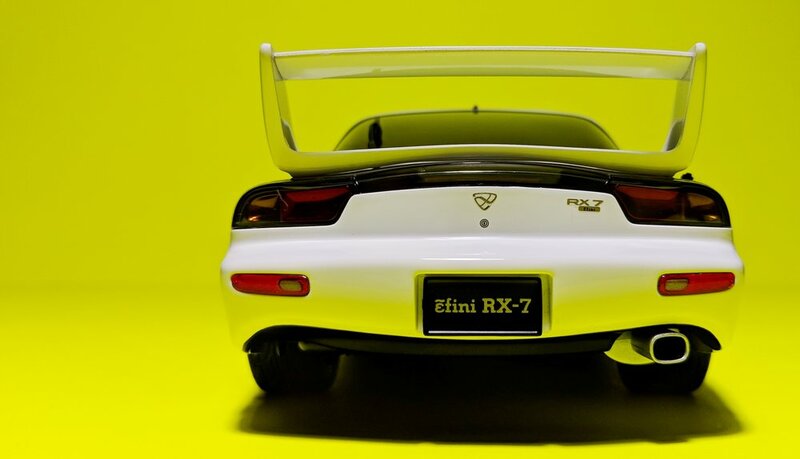 When it comes to tuners and tuned cars, there are two things I love to death: big wings and gold wheels. Much of what I collect are bone stock representations of their real counterparts, but today’s is a special case. 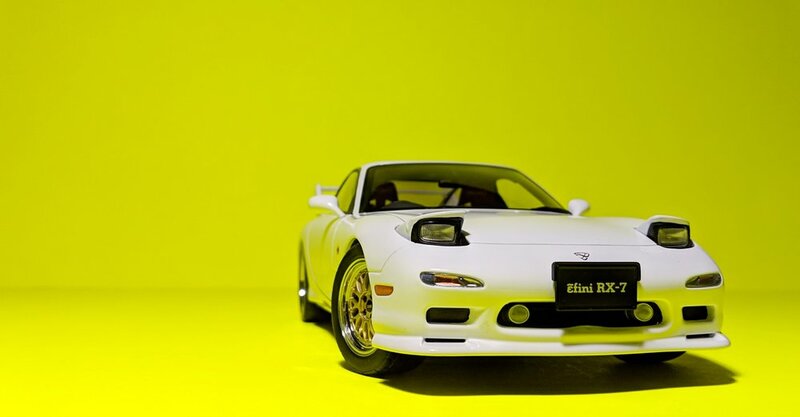 Here, we have a modified version of the FD-generation Mazda Efini RX-7, an iconic 90’s classic and one-third of Japan’s three-headed monster (Toyota Supra Mk.IV, Nissan 300ZX) of that decade. Efini, at the time, was a subdivision of Mazda that was created as a branding experiment - that never amounted to much. 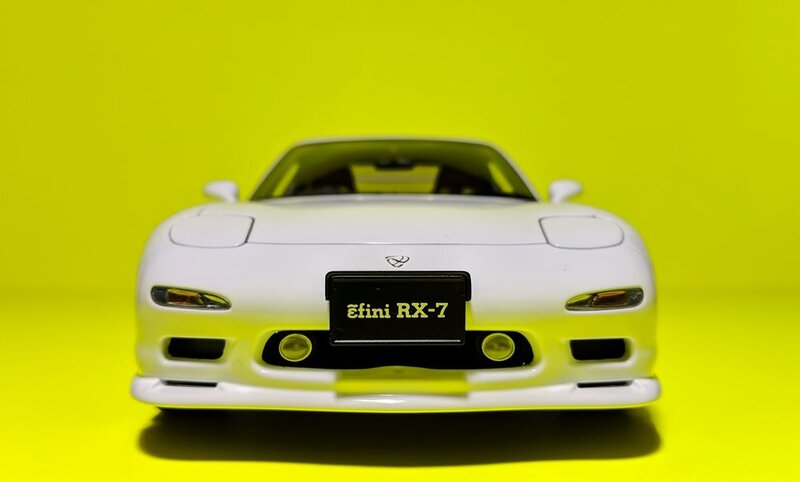 Hence, we drop that part of the name and simply call this the RX-7. 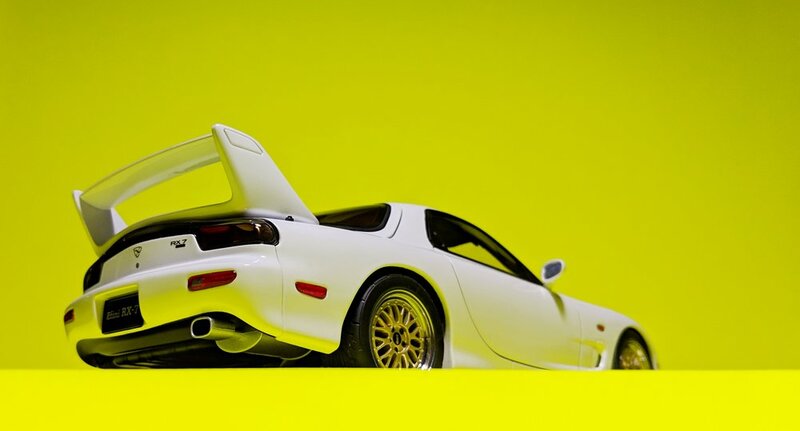 This casting is not to be confused with AUTOart’s other rendition of the FD3S, which is the RX-7 Spirit Type R. That one is strictly OEM; this shares the same mold as the “RedSuns” RX-7 from the Initial D series. Developing castings is expensive, so it’s best to get as much mileage out of them as possible. 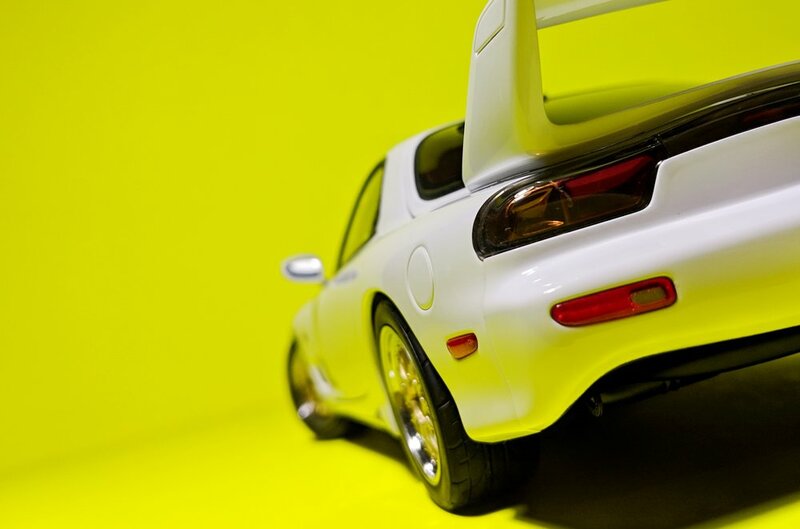 By removing all Initial D association and swapping out the wheels, AUTOart gave the car a new personality, releasing the model with “Tuned Version” added to its name - the same tactic they also used with the “NightKids” R32 GT-R. Adopting the obnoxious rear wing and larger front skirt from the RedSuns car, this Mazda is quite the looker. BBS LM’s look great on just about anything, and utilizing them here in gold, no less, seals the deal. The single, squared exhaust pipe going out the back looks like a Need For Speed add-on, but it’s not that bad, all things considered. 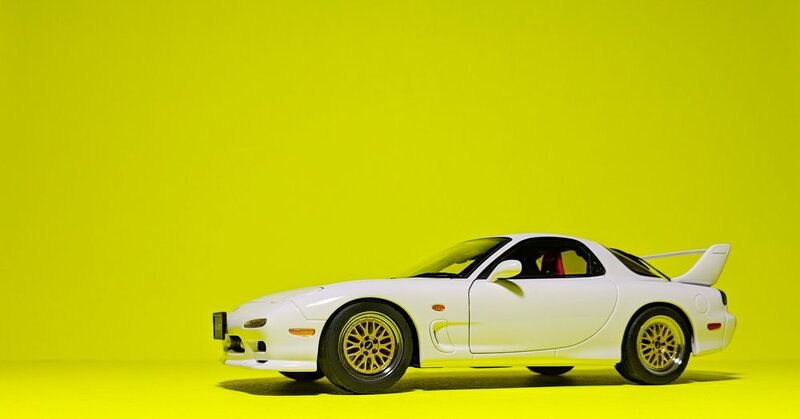 Overall, it’s hard to argue that this doesn’t have more visual appeal than a stock FD. Flipping a switch under the front bumper “activates” the pop-up headlights. Grown-ups get to play with their toys too, ok? Playing with this feature never gets old, and I will always prefer the way a car looks with its lights “up”. On the inside, the red Recaro buckets provide more evidence that this is a modified machine. Seat belts and carpeting are omnipresent. Right-hand drive because JDM. When it comes to the small details, AUTOart gives you everything without asking, whether it’s a $100 starter model or a $300 showpiece. We sometimes take for granted how good they are at this. Where other brands throw doglegs your way, they give you actual hinges held together by tiny screws. You get a strut to keep the hood propped up while you’re taking a peek inside. Engine bays come with, you know, actual wiring for maximum realism. The double-layered rear hatch is most fascinating and a work of art in itself, all pieces moving beautifully in sync to reveal the spacious storage compartment underneath. They call themselves AUTOart for a reason.